Y’all know how much I love personalizing anything and everything, and what could be better than a darling key chain? (I sound so Texan with that “y’all”, don’t I? ☺ ) As soon as I saw the new chipboard by Silhouette, I knew it would be the perfect way to make one! 1. Create the base for your key chains in the Silhouette software. I used a fun label that already had the hole punched in it, which made it super easy. The chipboard is on the thin side-not as thin as a cereal box, but not as thick other types of chipboard. For this reason, I knew I needed to stack several pieces on top of each other to make it durable enough for a key chain. I ended up printing a whole 12×12 sheet, just because they will also make adorable gift tags!!! You’ll also want to cut one matching piece out of cute scrapbook paper, for the very top piece. My pieces are all sized to 2.5 inches. 2. Once they’re cut, glue the tags together, lining them up on all edges. I used 6 pieces total. I love Scrapbooker’s Glue by Scotch…it has a fat end and a fine point end, so it works for lots of projects and types of application. Next you’ll glue on the piece made out of scrapbook paper. 3. Insert a picture into Word, and size it just a *tiny* bit bigger than your chipboard pieces. Print onto white cardstock, and cut it out. Trace the chipboard onto the back of the picture, and use scissors to cut it out. Match it up with your chipboard, and mark with a pencil where the hole is, then punch out with a small hole punch. 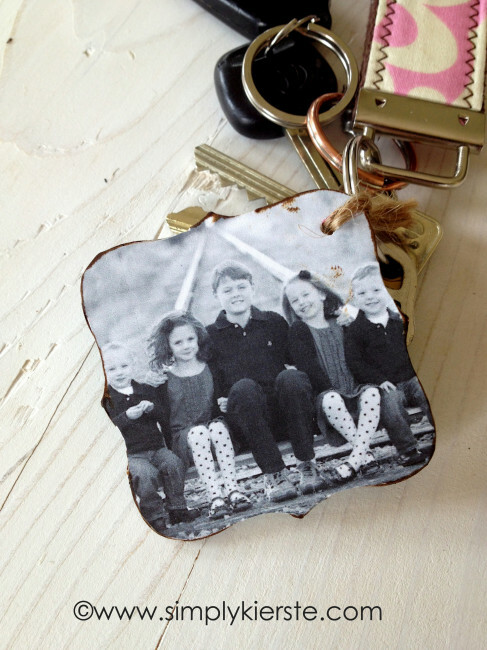 Adhere to the back side of your chipboard key chain, then go around the edges with scissors to trim off any excess. 4. Distress all the edges, then use embellish as you like. I used a stamp to create a simple initial, and I love it!!! 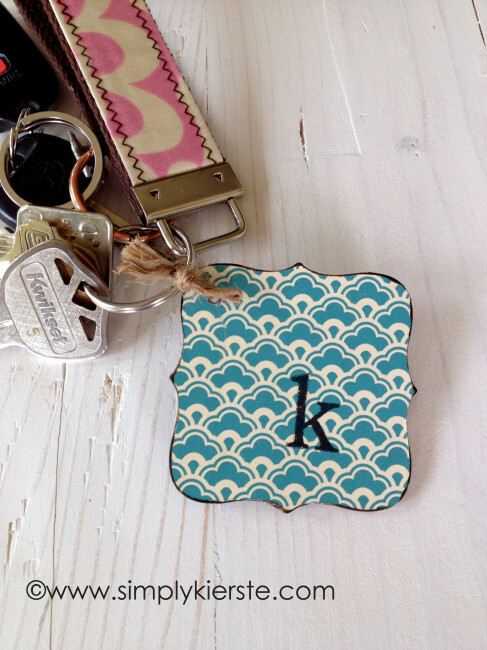 Seal the paper with a coat of mod podge, and once it’s dry, use jute to tie a tight knot onto your key ring!!! Love this! Have some chipboard left over. Might make this for mother’s day gifts! This is great. Chipboard is light so it won’t weigh down the keys. I love the children’s pictures. I think I would like to do that with my grandchildren’s pictures. Thanks for the inspiration and the tutorial! What a great way to use some leftover supplies! 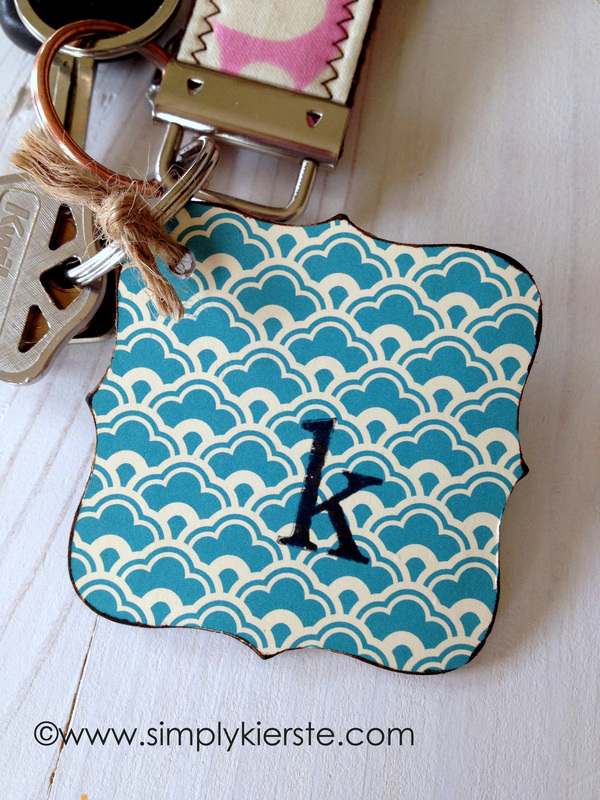 This key chain is too cute. I like how the possibilities are endless!